I must admit, TK Maxx is a store that I don’t often frequent – I like rummaging as much as the next person – but I’ve got to be in the right frame of mind, plus you never know what you’re going to end up with. Despite all this, I thought I’d try my chances at my local store to get a new jewellery box (a surprisingly difficult purchase!). Making my way to shoes, I remember my fiancé bought some Birkenstocks at TK Maxx a while ago, and I’ve been after some new Birkenstocks for over a year, so I browse through the sizes to see what’s on offer. 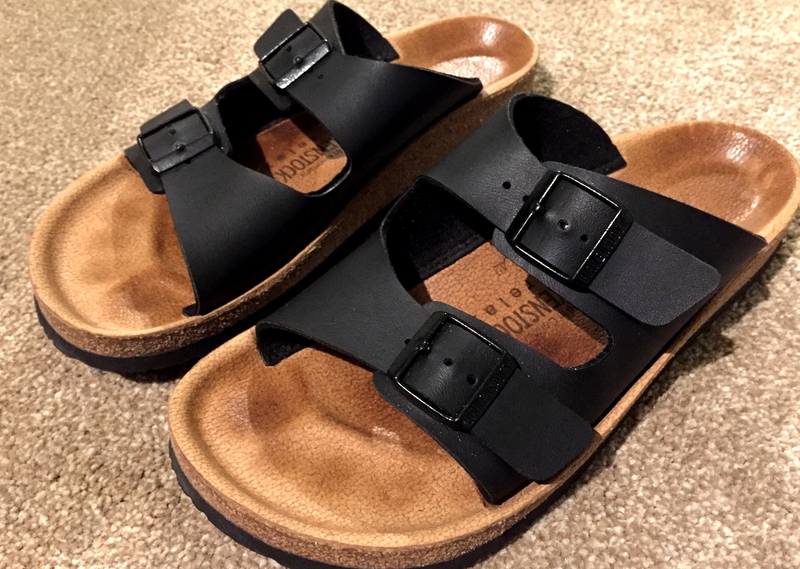 The Birkenstocks in the women’s department look a bit flimsy so I chance my luck in the men’s racks and find the perfect pair – black and in my size for £29.99, which is actually pretty cheap for Birkenstocks. As I remember I actually meant to come in here for a jewellery box, I head for the stairs, but not before a pair of killer black heels catch my eye. Seven and a half, they’re in my size, they’re Michael by Michael Kors and they’re AMAZING. Towering high, with a platform and shiny silver spheres on the front, I want them now. OK, OK they’re not the most practical but did I mention they’re shiny? £49.99 is a bit of an extravagant purchase for me but I couldn’t walk away. Put it on my credit card and see what the fiancé says when I get home! So, even though I didn’t get the jewellery box I was so hoping for, I certainly got a nice wardrobe update and a special treat for myself in the unlikeliest of places. Something tells me this won’t be the last time my credit card and I pop to TK Maxx. What do you think of TK Maxx – do you like rummaging around for a bargain? I love TK Maxx, I always find so many bargains (but then I buy so much that I totally spend more than I intended)! You definitely got some great bits – especially the Birkenstocks. I always spend more than I expected cos I’m like argh it won’t be here when I come back!